This is a flat walk. Much of it is along prepared surfaces. Beware of Lorries at Barnes Cray, between Slade Green and Dartford. Start at The Thames Barrier, Charlton, London. The route passes near Erith Station. The route finishes at Dartford Station..
Café at the Thames Barrier. 1). At first you must turn away from the river. Follow the Green Chain walk signs which go south through a park. Come to the main Woolwich Road. Turn left here and walk along the busy road until you come to a roundabout. On your way along Woolwich Road you will come to a Victorian School. This is now a junior school, but it used to be Charlton Boys secondary modern school. This was the place where I gave up the idea of becoming a teacher. I was trying to teach a class about the value of education. You can see that the school is on the edge of an industrial estate. The boys from the school all used to get jobs on the industrial estate. At the time I was there the whole estate was derelict and all of the factories were closed. But the school was still trying to educate the boys for jobs that were no longer there. At the roundabout cross Warspittle Road on your left. Tak the next exit, Ruston Road. Walk along this road to Harbinger Street. At the T junction turn right to gain the riverside route. Follow this route to the Woolwich Ferry. 2). Cross over the Ferry road at the crossing. There is an access road down a slope, round the back of the leisure centre. Take this to regain the river. Pass the entrance to the foot tunnel under the river. Pass the Royal Arsenal Gardens and the buildings of the old Woolwich Arsenal on your right. Continue to follow the river. You leave the Arsenal behind. The navigation is simple. Come to lakes and buildings on your right. This is Thamesmead Town. The town turns its back on the Thames so it does not have much impact on your walk. 3). At the end of the lakes you can descend to a road on your right. You can take this road to get to Thamesmead. At the end there is a T junction. You can find some bus stops here. Stops on the opposite side will take you to Woolwich. If you walk along the main road to the right you will find shops, cafes, and a greater selection of buses. The main route continues by the river and reaches Crossness with its shipping warning light. 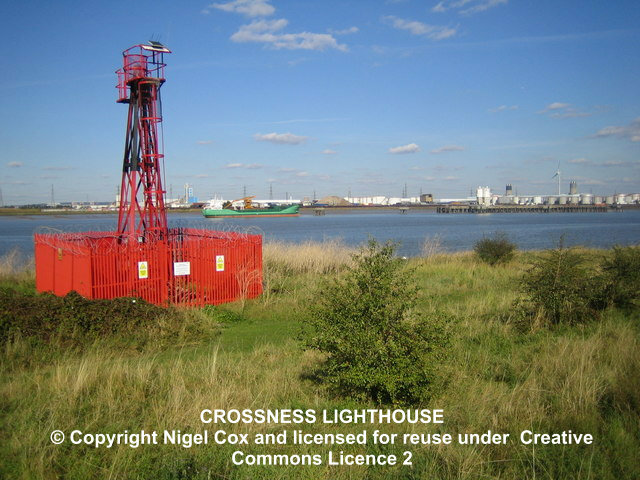 Pass a sewage works and then Crossness nature reserve, known for its birdwatching potential. In recent years, over 130 species of birds have been recorded on the 20 hectare site, including little egret, sanderling, ringed ousel, Cetti’s warbler and Dartford warbler. You can get to the reserve can path immediately east of the Sewage Works or from Eastern Way and Norman Road. Continue on, with industrial units on your right and fine views on your left, to reach Erith waterfront. 4).Follow signs through Erith marked “Thames Path Extension”. You will see signage to the station on your right. The station is just the other side of the dual carriage way. You have to go under an underpass to get there. 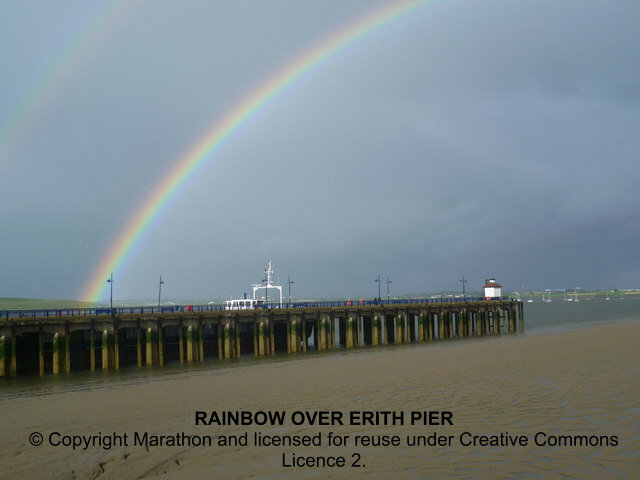 After Erith centre you must leave the Thames. Turn right into Wheatley Terrace Road and Appold Street. Then turn left into Manor Road. Look out for a signed footpath to the left after about 500 metres. Follow this as it heads first north and then east to reach Crayford Ness. Here you must turn right along the River Darent. One day, there may be a pedestrian bridge here, so you can follow the Thames without diversion. But for now you must continue inland. Follow the river Darent for about a kilometre. The route now turns right, followig the Cray River. 5). Come to a junction. The river turns left. There is a path to the left and also straight on. You have a decision to make. The path to the left goes to Dartford. The path straight ahead goes to Slade Green Station. It is a pleasant route, maintaining a countryside feel almost to the station. At the end of the track you join first a farm road and then a road through Victorian houses. Keep straight ahead until you reach the railway line. Turn right to see the station on your left. If your aim is to walk the Thames bank this alternative is the way to go. You are far from the Thames and the Kentish Thames 1 route will duplicate the much of the route that follows, albeit on the other bank. The route from here to Dartford is not particularly attractive, although it has its own wild charm. On the other hand, if you want to walk every step of the way, or you are aiming to do part of Kentish Thames 1 today, read on. To continue on the main route turn left. The route follows the river Cray past a river junction where it bears right, continuing along the riverside. You are then forced to turn right and then left to find yourself on a road in an industrial estate. Be careful here. There are heavy lorries. For much of the way the footway is separated from the road. Come to a Y fork. Turn left. Arrive at a main road by a roundabout. Turn left and almost immediately cross the Cray. Turn left down a lane about 50 metres after the roundabout. After perhaps 20 metres see a footpath sign and a footpath on your right. Follow the path down an unexpectedly pretty canal-like section and then pass under a railway bridge. You are following the Cray again, but this time on the other side. Walk alongside the river to the junction that you came to previously. Turn right and walk along the bund towards the main road. Just before the road bear right and then left to reach the main road. Turn left along the footway and cross the river. About 50 metres after the bridge you will see a footpath sign on your left. Cross a stile. Ahead of you, slightly to the right, is the route of the first section of the Kentish Thames Walk. You can pick the walk up here to avoid going into Dartford. The next possible stopping point is Greenhithe. To continue to Dartford turn sharp left and descend past some oil drums to go left under the main road, next to the river. Emerge into a field and continue to follow the edge of the river towards Dartford. You come to a point where the path is cantilevered over the river to avoid an industrial site. Just after this is a car park and a bridge over the river. At the bridge turn left, rather than crossing the river, and walk up an industrial road. At the end of this turn right and then right again on a main road. 6).Turn immediately left under the railway. Immediately on the right after the railway you will see a footpath which goes past a car park and up to Dartford station where the walk ends. 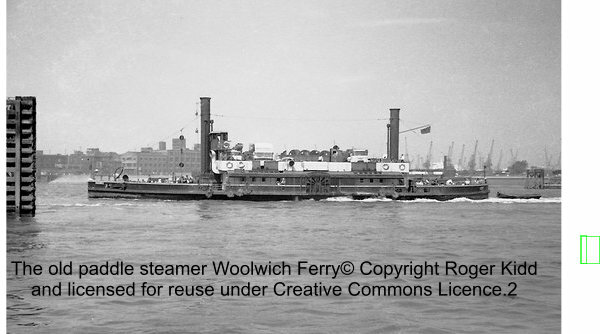 When I was little, my father used to take me on the Woolwich Ferry to see the northerners. We could tell that they were northern because they spoke with cockney accents. The boats were then paddle steamers (see picture) and it was great fun to descend into the depths of the boat as it was crossing to see the great workings of the pistons. In 1963 they were replaced with more modern boats, which are still used. The Ferry is an important part of the North and South Circular road system. Not so long ago, if you wanted to cross the Thames estuary side of Tower Bridge you were limited to the East London Underground line, congested Rotherhithe and Blackwall Tunnels, and the ferries here and at Gravesend. Now there is the Dartford motorway crossing, the Jubiliee line tube, the Docklands Light Railway, and, at least for a short time, Boris Johnson’s bizarre cable car. South London dockers were sometimes delayed from getting to work in the north if fog slowed up the ferry. So the parallel foot tunnel was built in 1912. You may find it interesting to take a break from your walk to have a ride on the ferry, perhaps returning via the tunnel. The area you walk past from just after Woolwich Ferry, to the greenery approaching Thamesmead was once one of the biggest armaments factories in Britain. It was founded in the 17th Century and, in the 1914-18 way, employed 80,000 men. The site gave its name to the Arsenal football team, but they moved away in 1912, finding the area to rough for their Islington tastes. The area is now mostly housing, café’s and shops. There are 23 listed buildings, including work by Vanbrugh and Hawksmoor. These are mainly at the western end of the site, which is worth exploring. Here you will find the Greenwich Heritage Centre and Firepower – the Royal Artillery Museum. This is a new town developed in the 1960’s onwards with a population of about 50,000. Some scenes from the film “Clockwork Orange” were filmed there. I may be wrong, but it does not seem like much of a fun place to live. 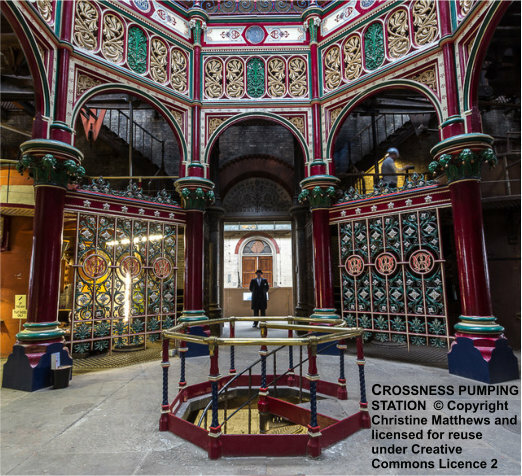 It was originally designed to house people displaced by slum clearance, but little thought seems to have been given to how they were to communicate with the rest of the world, from which it is cut off by the river and the railway line. Despite the existence of the railway line to the south, there is no rail service into most of Thamesmead, so residents wanting to get to work need to get on the bus and then the train. The new Crossrail services, which will run to Abbey Wood, to the south of the Town, may make things a bit easier. 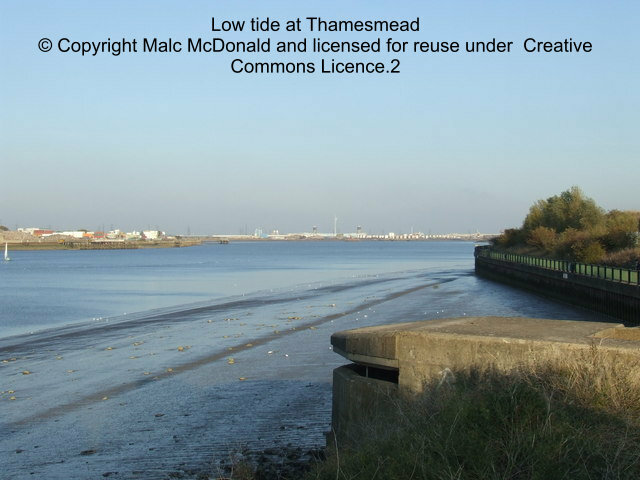 Most noteable is how the Town ignores the Thames. Later developments along the river have made a big feature of it, but in the 1960s it was still seen as something a bit dirty, to be avoided. Sadly, while restoration is taking place, open days are rare and, at the moment, it is difficult to get access from the route. You must walk past the modern sewage works, turn right along the east side, and then right again to get to the entrance. Between Erith and Crayford Ness are Crayford Saltings, one of the last remaining salt marshes in the region. At low tide you can sometimes see the remains of an ancient forest. In the mudflats around the Darent barrier are the homes of lapwings, shell ducks and oyster catchers. If you complete the full walk you will walk on both sides of Crayford Creek and its reeds. In summer you can hear reed-warblers singing here. On the Slade Green station alternative you can see Howbury moat and Tithe barn. The moated structure was built by the half-brother of William the Conquerer and was lived in till 1935. The tithe barn dates from the 1600s.